in honor of pac-man joining the smash bros. roster, i thought i’d dust off my copy of the wii namco compilation, namco museum megamix (i’d played xevious a couple of years ago) and chow down on some tasty ghosts. that compilation doesn’t include ms. pac-man, which wasn’t actually developed by namco and thus, despite its enduring popularity, tends to be less acknowledged by them in general. so instead i ended up playing super pac-man (released to arcades in late 1982). i’d heard of super pac-man, but its availability has been somewhat spotty over the years and it wasn’t until namco museum remix and namco museum megamix that it became more readily available. at its core the game is much the same as the original pac-man in that you’ll be chomping everything in sight and avoiding ghosts until you get a power pellet, at which point the tables turn and you try to chase them down to rack up points. 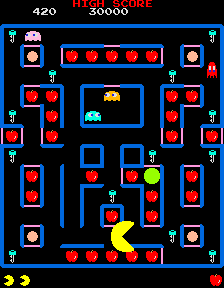 super pac-man adds a new twist in that some munchables are locked behind doors, and you have to nab keys located in regular spots on the board in order to unlock them. a “super” pellet transforms ol’ pac into the eponymous “super pac-man” who not only becomes big and can “fly” over ghosts and burst through doors without a key, but he can also zoom around the board by holding down a button while steering as usual. there’s also a bonus level every four boards which is the same as a regular board except there are no ghosts, you have constant super power, and there’s a time limit. i should preface my analysis of the game by saying that ms. pac-man was one of the games i made a beeline for at my local chuck e. cheese’s growing up and that i owned the original NES version of pac-man, and so although i’m not anywhere near a competitive player, i’m not a casual player either. i enjoyed the change of pace of super pac-man, and it was interesting to see how even though the board remains the same, the layout can feel quite different based on which doors are open and which are closed. the game becomes increasingly harder by making it so that keys open doors that are located far away from them, which does help add variety. as someone who grew up playing pac-man and ms. pac-man the problem, though, is that this game doesn’t really let you get settled into a groove. in pac-man seeing the same board over and over again got a bit tiresome, but ms. pac-man has four boards which provides a good amount of variety. there’s no way of just looking at a board in super pac-man and knowing which doors the keys will unlock, which is good for variety but bad for getting into the zone. with more time i’m sure you could learn that board # X corresponds to configuration Y and i suppose eventually i would be able to adjust to having to spend every moment reacting on the fly, but in the end i just felt like the changes gave the game a new feel that just wasn’t as much fun. (compare to pac-man arrangement from 1996, which i quite enjoyed.) the wii remote controller worked fine, although the D-pad didn’t allow the really precise movements the game required: next time i’ll have to try using the nunchuk or wii classic controllers instead. last thing: as with other games on the compilation, the version of the game in namco museum megamix offers a stage select, which is great to have. – apparently there was a pac-man board game by milton bradley. weird! the pac-man wikia has more info.